“I want the loft converted into a library. Will it be possible?” This was the question that Lisa asked us when she approached us for a loft conversion. Well, this is something new isn’t it? I mean creating a brand new library in the loft. It will be a complete readers paradise. We put in some thought about this concept and visualised few ideas that would go well with this. However, there are few things that we need to check before doing this. In loft conversions waterproofing is always an important thing to be done, but it is very crucial, especially when you are planning to convert the loft into a library. Think of all the valuable collection of books that may go a waste when they get wet. Checking for the leaks and fixing them should be the first priority in a loft conversoin. A good quality waterproofing material will do the magic! As said, a library is where you spend some quality time, so the colours should give you a pleasant ambiance. Neutral colours like ivory, shades of pink and blue, muted colours of green and so on will do wonders in your loft library. Loft conversion ideas like these really help while decorating and designing. Well, we are talking about a library there and so the furniture should suit that well. For those who want a touch of elegance, choosing some vintage furniture will be good enough. There are many sleek and modern furniture that not only save the space but at the same time give a chic look to the entire set up. Have you ever thought of using the sloping walls? There are many storage options there. You can easily convert them into bookshelves. 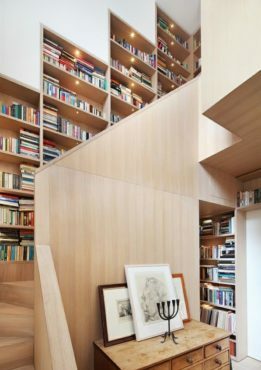 With proper planning and creativity, this could definitely be reader’s paradise. The last thing that you should add, is of course, books. Plenty of books will give the magical touch of a library. I suggest you go for some open book shelves to give it the feeling of a library. When we talk about ventilation, we have the option to use “Velux windows”. Streaming natural light through the windows, these really make a wonderful choice. 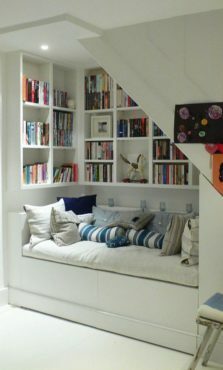 We at Central London lofts can take care of the entire set up of converting your loft space into a wonderful library. Check these beautiful interiors that may spark up few ideas in your brain to decorate the library as you wish. Check these walls, they have made use of the entire space. A perfect nook for a book worm. Simply and cosy enough to spend the weekend reading your favourite books. 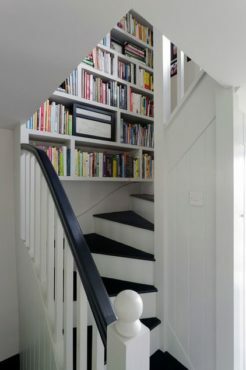 In this design, the bookshelf is aligned along with the stairs. I feel this is really a good way to maximise the space. Don’t you think so? A similar idea. The owners definitely knew what should be done and how it is to be done. 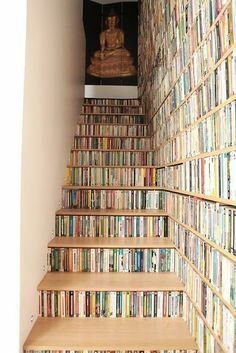 Covering up the entire staircase with books, is really a wonderful idea. Any words for this? I say this is really a brilliant idea. Making use of the stairs along with the walls. This is really good because the entire space is used up.